Announcement 3 November 2007 It is with regret, and with deepest sympathies to the family, that we note the death of Sheila Dorothy Malkin who died peacefully on 26 October 2007, age 73. 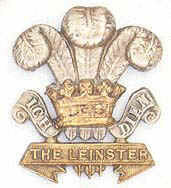 Sheila was always present at the Association meetings in the Leinster Arms, her jacket festooned with memorabilia of the Leinster Regiment. Once met and never forgotten! A retired Metropolitan Police Officer and Social Worker, Sheila was a keen supporter of the Association and her presence will be missed by all who knew her. Sheila was laid to rest on the 12 November and a number of Association members were present at the funeral to pay their respects. Announcement: 26 October 2007 It is with regret, and with deepest sympathies to his family, that we note the death of Major James (Jim) McLeod, late London Irish Rifles and President of the London Irish Rifles Band. Major Macleod died unexpectedly, though peacefully, on the 20th October. Major Macleod was a founder member of the Leinster Regiment Association and Chairman of the Combined Irish Regiments O.C. Association. A private, family only, funeral will take place on Wednesday 31 October. There will be a commemoration of Jim's life on the afternoon of the 31st October at the Royal Chase Hotel, Enfield, that will be attended by the Chairman, Secretary and Treasurer of the Association. A special memorial service will be included by Father Patrick Cassidy within the Irish Regiments Commemoration Service to be held on Thursday 8 November 2007 at 2pm in St Patrick's Chapel, Westminster Cathedral, London,SW1, Leinster Regiment Association members who wish to attend this service are requested to be in place by 13.55hrs. Announcement: 01 January 2007 Major General (Rtd) David Nial Creagh O’MORCHOE, CB, MBE in the NEW YEAR HONOURS 2007 is awarded the CBE (Commander of the Order of the British Empire). For services to British ex-servicemen and women in Ireland. Announcement: It is with regret, and with deepest sympathies to his family, that we note the death of Mr. Michael Doyle's whose funeral will take place: 11 am Wednesday 16 November at St Augustine's Church, Deanwood Road, Parkwood, Rainham, Kent and afterwards to Woodlands Cemetery, Woodlands Road, Gillingham. Family flowers only, but donations to Cancer Research at Wisdom Hospice, Rochester. A piper from the London Irish rifles will be present. Michael hailed from Dundrum, Co. Dublin and served with the Royal Ulster Rifles. He was a Leinster member from the outset of our reformation, most of you would know him as the treasurer of the Combined Irish Regiments Association and he was a very well known face at the Combined Irish Regiments parade to Whitehall every June, issuing the wreaths to all regimental association representatives and I am sure he will be very sorely missed. Acknowledgement We note with gratitude the assistance given to our new Association by the Combined Irish Regiments OCA who have for so many years kept alive the name of the Prince of Wales's Leinster Regiment (Royal Canadians). Our thanks also to Comdt Michael McGoona for all the work he has done on behalf of the Regiment in Ireland and the U.K. Acknowledgement Advice has been provided to the Chairman on creating an Association website by James Finbarr O'Sullivan whose father served in the Royal Muster Fusiliers and to whom he has dedicated his own Website. Acknowledgement Major MacLeod has kindly written on our behalf to Colonel Noseworthy the Canadian Army Advisor and has informed him or our Association. It is hoped that the link with Canada can be re-established.